‘You are awesome.’ These are words that every 13-year-old girl needs to hear from her dad. They’re much more helpful than ‘You are pretty’ or ‘You are nice.’ The dad doing the verbal high-fiving in this inspiring doc is Agalai, a Mongolian eagle hunter. Eagle hunting is a tribal tradition that goes back 2,000 years among Kazakh nomadic men, who ride out on horseback with an eagle across the frozen Central Asian steppes to catch foxes and rabbits. It’s a father-and-son thing. But enlightened Agalai understands that his pigtailed teenage daughter Aisholpan has the grit and talent to be a hunter. Aisholpan is one of life’s trailblazers – a feminist pioneer who would never in a million years think about herself in those terms. But hardwired inside her is the belief that girls can do anything boys can; and she’s got the iron will to prove it. Eagle hunting essentially involves riding a horse like the clappers holding a piece of raw meat while a golden eagle flies at you at 30 miles an hour, knife-sharp talons poised. It’s thrilling, and you can see why actress Daisy Ridley – tough heroine Rey in ‘Star Wars: A Force Awakens’ – signed up to narrate the film. After her training, Aisholpan’s dad takes her to the national championships, where she’s the first ever female competitor. What’s interesting is how standard sexism is across cultures. A bunch of miserable male eagle hunters dismiss Aisholpan: ‘Women are supposed to stay indoors’ and ‘They get cold.’ Then, when she starts winning, they switch tactic, the hypocrites:‘It helps that she’s a girl’ – as if somehow that explains her skills. You want to know more about what Aisholpan is thinking behind that shy determined smile. But that’s not her way. You can imagine her as the gutsy heroine of a Disney animation. Despite being super glossy and definitely involving pre-staging of some of the 'real-life' documented scenes, this film is an absolute joy to watch. 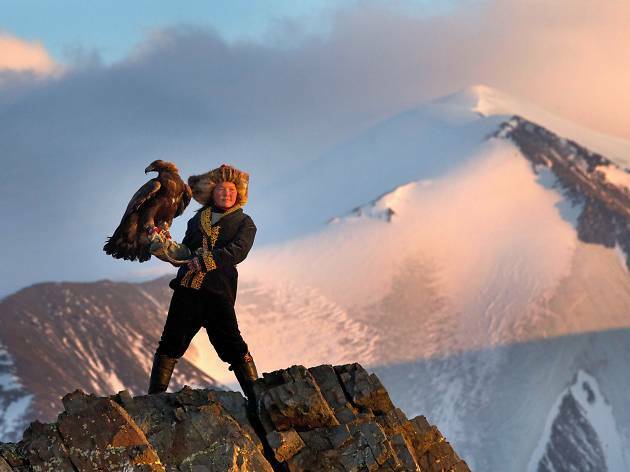 Firstly it's just so incredible to learn about the tradition of Eagle hunting in North West Mongolia (which is not the hunting of eagles by the way, it's really the opposite - the training of eagles to be a family's personal hunter), something which I'd never heard of before. 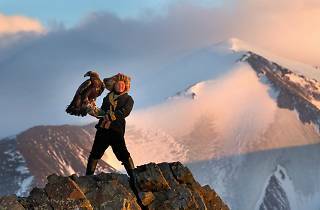 Secondly it's wonderful to see the delightful story of the first, and youngest, female eagle huntress as she learns this ancient skill against the backdrop of a disproving male hierarchy. And finally the relationship between the heroin and her family, particularly her father as her teacher, is so moving as you witness the love between them and the bravery of this determined young women. An absolute treat of a film, with wonderful cinematography, which will leave you with a tear in your eye and a smile plastered across your face. I'm not usually one to enjoy documentaries unless it's about something I'm really interested in, and while I can appreciate their incredible size and power, I've never really been that interested in eagles. However, I found this documentary film captivating. not understanding why she wouldn't prefer to stay at home to 'prepare tea', leaving the Eagle hunting to the males. Fortunately her dad is devoted to teaching her the skills she needs to raise, train and manage her Eagle despite the disapproval. Yes, Aisholpan's plight is incredibly inspiring but what I was more enchanted by is the cinematography. It is shot so beautifully, really capturing the expansive, severe and serene surroundings of Bayan Olgii where her and her family live their nomadic lives. Not that long ago swooping aerial shots like these would've only been possible by helicopter so it's a real testament to the benefits of drones- being able to capture incredible scenery on a small budget. This is far from a documentary about eagles, it's about determination, relationships and beauty.